Find the offense that best fits the skills of your team. To be most successful, a good coach should match their offensive system to their team rather than making every team fit the mold of a single offensive system. University of Louisville Coach Anne Kordes, along with “the best 7th & 8th graders in Louisville,” dive into team offenses, thoroughly explaining the pros and cons of the three most common volleyball offenses: 4-2, 6-2, and 5-1. Before getting into the offenses, teams must have a solid understanding of “overlapping” to avoid giving up unearned, out of rotation points to the opponent. In her fast-paced, but easy to understand style, Coach Kordes explains the six zones, rotations and where the players need to line-up according to each rotation. She does a great job of showing who can and cannot overlap in each rotation, allowing coaches to decide how they want their teams to serve-receive and who they want to pass. Kordes has players walk through each rotation in each system demonstrating how to line up for serve receive and transition to attack. 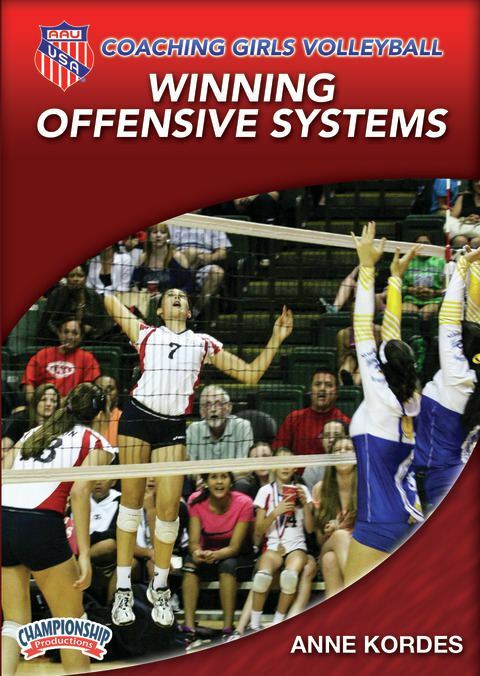 Each offense is explained in detail, with advice on which types of setters will do well with each offense. She takes players through different rotations and serve-receive formations providing an in-depth picture of the systems’ workings. Want to keep the defense guessing? Coach Kordes breaks down the art of calling sets, describing each hitting zone at the net and the three most common set heights. With Kordes’ insights, you can teach your athletes to identify the location and tempo of any set. She also gives advice on how to best set your line up and utilize subs so rotations are always balanced to maximize your team’s talent. Her thorough explanations make it simple for any coach to make smart, aggressive decisions on line up. Whether you’re a new coach needing a thorough explanation of rotation zones, lineup strategy, signaling sets, and running specific offensive systems or an experienced coach wanting a refresher, this video has something for everyone! Learn how to choose the best offensive system for your team and put your team in the best possible position for success his season! (This series of videos was produced by Championship Productions in association with AAU (The Amateur Athletic Union).